There are so many authors attending Book Expo America in Chicago this week, and we want to do a little dreaming here at home in our armchairs! 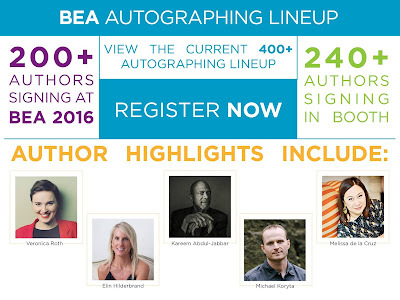 Take a look at the full line-up here at the BEA website, and then come back here and share in the comments the authors that you would like to meet if you were in Chicago this week. It may not be the same, but as readers we are all good about escaping to places near, far, and imaginary! Kate Beaton, Kwame Alexander, Mo Willems, and Shannon Hale. Veronica Roth for sure. I love the Divergent series and we have the same birthday. It's on my bucket list to meet her. there are so many....Kami Garcia, Kendare Blake, Lisa McMann, Mary Kubica, Ridley Pearson, S.J. Kincaid, Shannon Hale and Dean Hale, Sona Charaipotra and Dhonielle Clayton, Wesley Chu, William Kent Krueger, Kerri Maniscalco, Alexandra Bracken, Leigh Bardugo (I have met her once, though that was a couple years ago, want to see her again), Maggie Stiefvater (I am hoping to see her on Monday the 16th!! ), Marissa Meyer, Meg Cabot, Melissa de la Cruz, and several others!!! I'm sure I'll sound like a complete idiot but most are used to it, so I try to not let it get to me! LOL!